Contributions to the XL Dream Run have reached $2050 and 13,500Rs. There's still a way to go before hitting the targeted 10,000$ mark. To inspire you to donate, here are some appeals from XLers who have already donated to the cause. Now that the clouds have parted and beam of sunlight shines on the US of A, I would like to remind you guys to reach into your pocket and give some money for this good cause. According to Madhukar, they have reached 50% of their target. This was what I had contemplated doing graduating from XL, but did not have the guts to do so. These new kids have the conviction to do it. So for the sacrifice of a week of Starbucks lattes or a dinner at a decent restaurant, you can help these guys succeed in their endeavors. Yeah, I know times are tough, but see it as a opportunity to kick that caffeine habit. madhukar... can i do a parallel effort ..since none of us can be in jameshedpur for the run. So '81 batch, here is the option: i am attempting to cycle 75km on 16th november as part of the bangalore ultra marathon (ok, its a run, but as an ex runner, i am being allowed to cycle it, and 75km is a huge strecth for me, i may end up doing far less)- so will any of you pledge moneys for every 5km I cycle ? and pay directly to the Xl dream run site , once i confirm back on how much i was really able to achieve on 16th It will also be a huge motivator for me to push on ! 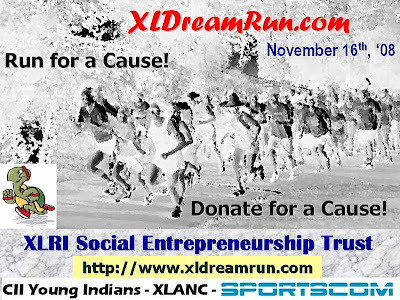 XL Dream Run is a unique – and perhaps first of its kind in any B-School – event, when 300 students of XLRI Jamshedpur would run to raise funds for a cause – The XLRI Social Entrepreneurship Trust. The event will be held on November 16th, '08 in Jamshedpur. The 300 students registered for the event also include the exchange students from 5 b-schools in France, Germany, Manila, and Sweden who are spending one term at XLRI. Some faculty have also registered for the event. The funds are donated by XLRI alumni through the website of the event (http://www.xldreamrun.com) or through bank-transfer/ cheques. The donations have started coming in – and are increasing everyday – from alumni across batches & located across the globe - USA, UK, UAE, Egypt, Singapore, Switzerland, and of course, India. A large part of India’s traditional rural and tribal art is dying because (1) the artisans, being disconnected from the market, have not been able to contemporize their designs, and (2) since they have no direct access to the market, do not find their work remunerative enough to continue. has built The Learning & Design Center, where the rural/tribal artisans will be trained to develop the product-prototypes, and the first workshop is likely to be held within a month or so. A large number of Indian villages are geographically scattered, a for most the national power grid passes by kilometers away. Providing electricity can only be done through a more decentralized and self-sustaining model. After seeing the working model, Tata Motor's CSR dept and SEEDS (an NGO) have accepted to order 5 units each for testing in the villages they serve. L&T has seen the prototype, and in principle agreed to acquire some for their CSR activities... etc. This is the youngest venture of all – got registered as a firm less than a month back. It is a venture which aims to use online market-surveys to generate funds for registered NGOs. It is being mentored by an XLRI alumnus, with more than 20years of experience in market research. will sponsor the T-Shirts for the event.